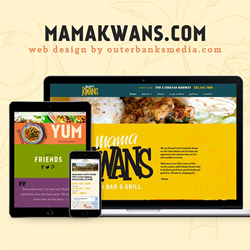 New online presence for favorite Outer Banks restaurant, Mama Kwan's, showcases food and fun while providing a good mobile experience. Outer Banks Media has worked with me to keep Mama Kwan's brand and online presence relevant and fresh. We are in the middle of another growth spurt at Mama's and our online identity has helped drive new customers to us. Outer Banks Media (OBX Media), a North Carolina-based digital marketing agency specializing in website design, search engine optimization and internet marketing, announced the website launch for Mama Kwan’s Tiki Bar and Grill,, an Outer Banks favorite for over a decade with their own twist on food from around the world – and around the block. Mama Kwan’s wanted to give their existing website a design refresh to maximize the power of their brand, as well as to optimize their website for mobile viewing. Their new, responsive website provides an ideal viewing and interactive experience for visitors on mobile devices, minimizing the need to scroll or re-size pages in order to view them properly. From a design standpoint, OBX Media and Mama Kwan’s worked together to update the brand image, from colors and patterns to font styles. OBX Media added eye-catching design elements and images of delicious menu items to encourage longer (and multiple) page views, while getting website visitors the information they need quickly. With social media being a big part of Mama Kwan’s successful marketing strategy and overall brand presence, OBX Media integrated their Facebook, Foursquare and Twitter accounts with the refreshed site. This gives visitors instant access to posts, reviews and menu information. “Outer Banks Media has worked with me to keep Mama Kwan's brand and online presence relevant and fresh. We are in the middle of another growth spurt at Mama's and our online identity has helped drive new customers to our restaurant,” said Kevin Cherry, Owner of Mama Kwan’s. To contact Mama Kwan’s for their hours, questions about their menus and to buy t-shirts and tiki glasses, please call 252-441-7889 or contact them from their website.